Let's not even speak about the huge, humongous collection to various styles and types of Chow Mein. Aplenty mind you. In fact, spilling over crazily. To believe me, do the search in the virtual world. I bet you will be confused which recipe you should nail. Even for the vegetarian Chow Mein mind you. Did I peep or slyly steal other people's recipes? Neh? Whatever for? When we have decided to use our previously gained experiences in our kitchen (Vegetarian Fried Bee Hoon, Mee Rebus Vegetarian, Chinese Vegetarian Noodle Soup, Mee Rojak Vegetarian, Curry Mee Vegetarian & Vegetarian Mee Hoon). So, I say none further except introduce Vegetarian Chow Mein to you right now at this juncture. I believe egg noodles and egg by itself may be a restraining order for some vegetarians? Whereas others are super fine? To the pure vegetarians, switch to wheat noodles and obviously, don't crack the egg. 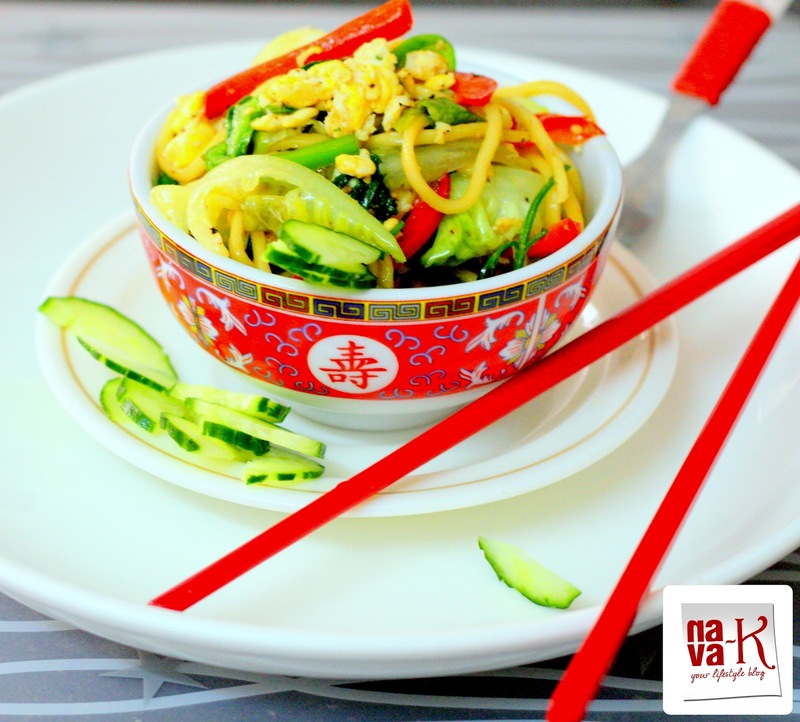 Vegetarian Chow Mein is a truthful bridge to a healthy noodle dish. Heat 2-3 tbsp oil and when heated, break in eggs. Fry or scramble, remove and keep aside. Into the same wok, pour 2 tbsp of oil. Add yellow noodles and stir for about 2-3 mins. Pour in vegetable broth and let the noodles be cooked. Stir over high heat for a couple of time and dish out. (Optional: Serve with slices of cucumber). Delicious noodles, Love the noodles when it contains vegetables. I love this kind of noodles mixed with vegetable and yes I would like to serve with sliced cucumber,,,very healty meal indeed !! Nava, I love how you've presented this soup. It looks so delicious and fresh! it has more ingredients compare to noodles..
Wow, love those colours! It's red hot!! I can see how these noodles would be perfect for soup but they also make for a delicious meal! Your recipe is just too good to pass! Will try these over the weekend. 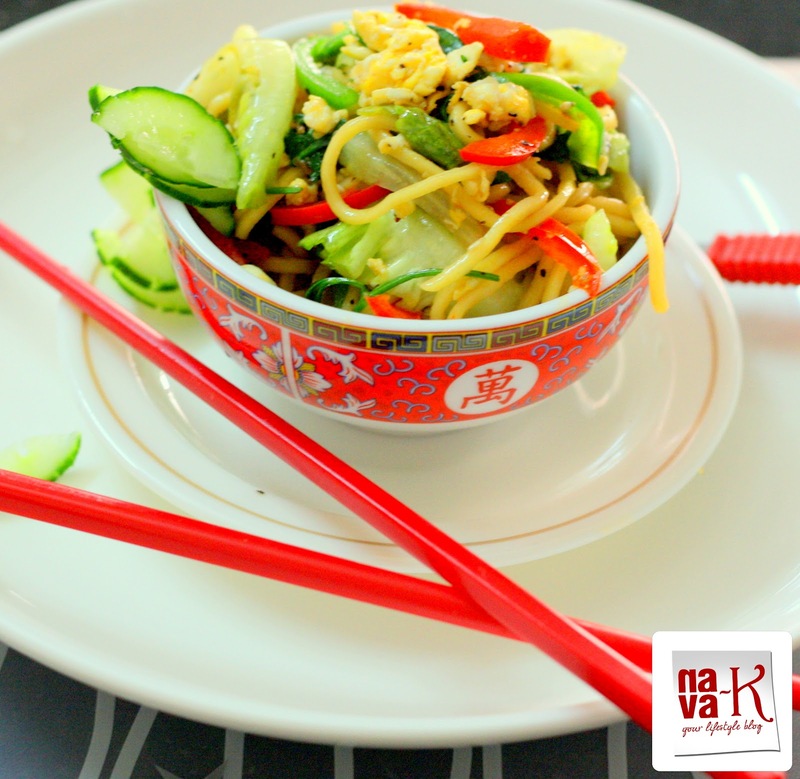 These noodles are totally calling my name! hi nava, interesting ingredients- also, i never knew there is a vegetable broth, must look this up.